These rolls from Deliciously Ella make the best appetizers or snacks. Unbelievably simple to put together, they’re also a refreshing summer picnic food, thanks to the juicy lime and cool strips of cucumber. Use a potato peeler to peel the green skin off the cucumber and discard. Peel thick strips of cucumber lengthwise, starting with one side and then the other. You want to avoid the very middle of the cucumber as it’s too flimsy to hold the rolls. Once both cucumbers have been peeled, roll each slice into a tight circle (the tighter they are, the better they stay together). Slice the avocados into small cubes and fill the center of each roll with avocado (again, the fuller and more compact it is, the better it holds together). Once all the rolls have been made, drizzle the lime juice and olive oil over the top of them and sprinkle on the salt and pepper. A plant-based diet rich in nutrients and vitamins and low in sugar, gluten and processed ingredients and work wonders in improving the body's natural defenses and warding off the early onset of chronic illness. 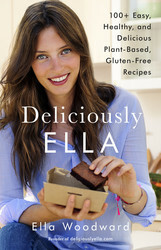 Deliciously Ella is an essential, how-to guide to clean, plant-based eating that provides a foundation for a pure, unprocessed, unrefined diet, so you can look and feel better while enjoying great food, including blueberry muffins and key lime pie.